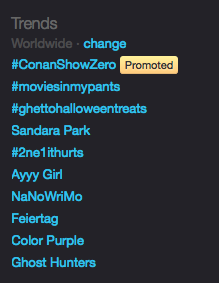 2NE1 fans join the Twitter War! After the release of the group’s Tim Burton-esqe mv ‘It Hurts’ fans made a concentrated effort to trend the group, vid and Dara on Twitter. They’re pretty close to Conan O’Brien! Now, I don’t put much stock into Twitter’s trending topics (or Twitter for that matter) and I love my CoCo, but I’ll let it slide this time because the video was timed so perfectly. Where’s my Edward Scissorhands dvd?